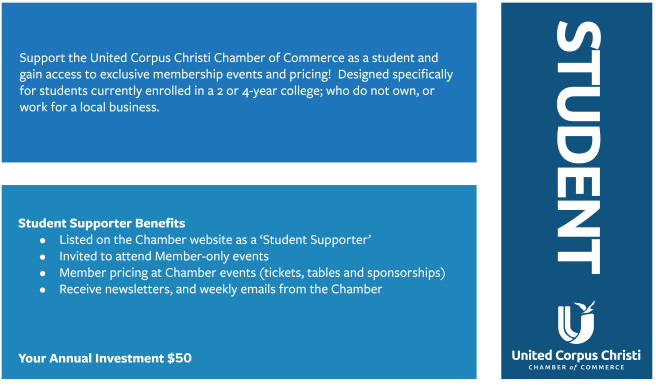 The United Corpus Christi Chamber of Commerce offers the opportunity for currently enrolled college students to get involved with the Chamber as a Student Supporter and gain access to exclusive membership events and pricing! Thank you to our Student Supporters. We also offer the opportunity for individuals to get involved with the Chamber as a Friend of the Chamber. For questions regarding these additional means of support, contact Efrain Franco, Membership Engagement Director for the United Corpus Christi Chamber of Commerce, at 361.881.1800 or efrain@unitedcorpuschristichamber.com.